The ecology of orchids is a topic as convoluted and complex as the flowers themselves. Over 25,000 species of orchids are described: about one tenth the world's total plant species. Nearly all these orchids are pollinated by insectsnotably bees and wasps, but also butterflies, ants, flies and others. Moreover, almost every orchid species is pollinated by just one or two kinds of insects. Even though they are plentiful, a species of orchid may go extinct if its pollinator insect dies out. 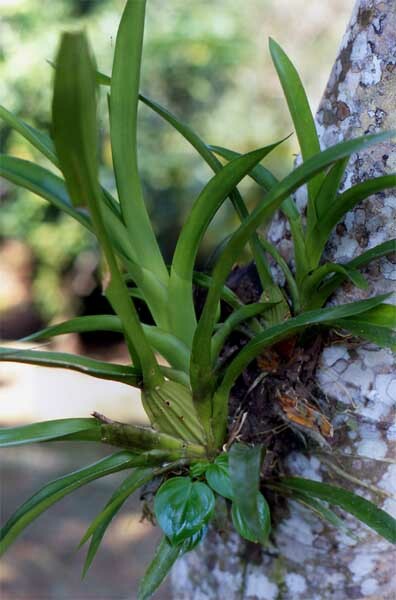 Many orchids live on other plants (epiphytic) or on rocks (lithophytic). Although most orchids live in damp, tropical rainforest, in some ways their adaptations closely resemble cacti. High in the canopy, the microhabitat is hot and dry, with intense sunlight. Orchids do not need soil to growjust somewhere with lots of light and to attach their roots. A tree trunk does fine. Orchid roots, unlike those of most plants, tolerate exposure to light. They are surrounded by a protective substance called "velamen," The strap-like leaves have a waxy coat to minimize water loss and swellings, called "pseudobulbs," at the base of the leaf are used to store water. This picture shows typical adaptations of the orchid structure. Note the ribbed pseudobulb (center), the whitish roots (lower right) and strap-like leaves. The shiny, heart-shaped leaves at the base of the orchid plant belong to a type of peperomia.